I've been working on a new project the past couple of weeks that (fortunately) requires Google Web Toolkit (GWT) and I wanted to use the new UiBinder that was released with GWT 2.0 in early December for a number of reasons (clean separation of UI and code, easier collaboration with designers, easier testing, etc ). However, I was having a hard time getting my head wrapped around it given that the GWT site has very little documentation and only a few examples. I've combed through the message boards, the docs and the sample Mail application that comes with the SDK and after finally groking the new functionality, I put together a little Hello World app, the kind that would have helped me out originally. 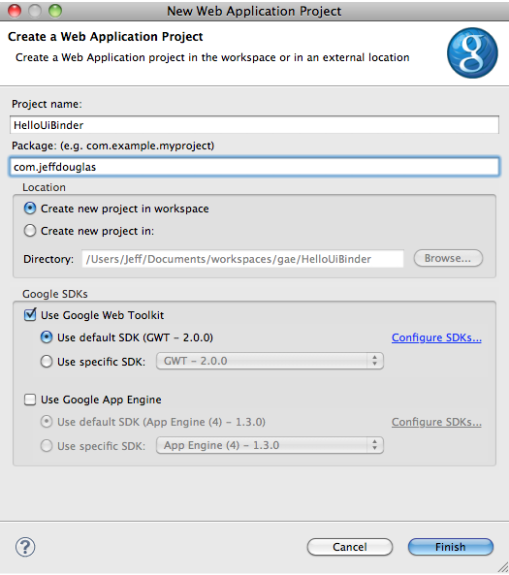 So I'm making some assumptions that you already have the GWT SDK and Eclipse Plugin installed and are familiar with both of them. If you are not, take a look at the GWT site for more info. To get started, create a new Web Application Project called "HelloUiBinder" in the package of your choice but do not check "Use Google App Engine". Open the MyBinderWidget.ui.xml template and add the following code. With GWT you can define your styles either in your template where you need them or externally. I've added a small style inline that adds some pizzaz to the label. Notice the field name myPanelContent in the template. You can programmatically read and write to this field from the template's owner class. So when the owner class runs, it construct a new VerticalPanel, does something with it (probably add some type of content) and then fill this field with it. Now open HelloUiBinder.html and remove all of the HTML content between the </noscript> and and </body> save it. Once you run the application, copy the development URL and run paste it into your favorite supported browser, you should see the following. Now suppose you wanted to nest a widget inside your MyBinderWidget that did something when a button was clicked. We'll create a small series of checkboxes that allows the user to select their favorite colors and display them when the button is clicked. 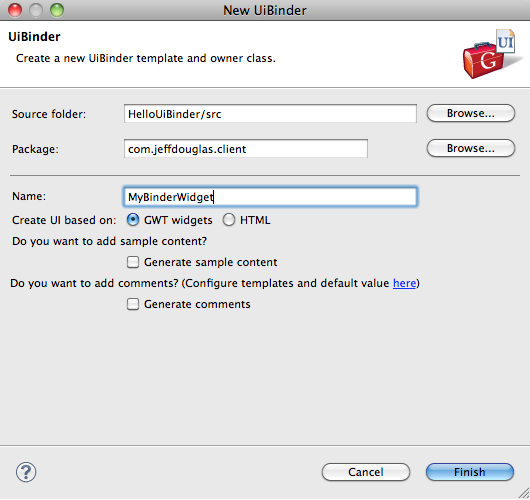 Create a new UiBinder called FavoriteColorWidget in the client package. Add the following code to the FavoriteColorWidget.ui.xml template. Now add the click handler in the FavoriteColorWidget.java owner class. The last thing we'll need to do is add our new widget to the MyBinderWidget template. Open MyBinderWidget.ui.xml and add the custom namespace reference and the FavoriteColorWidget.